All Imogene Scott knows of her mother is the bedtime story her father told her as a child. It's the story of how her parents met: he, a forensic pathologist, she, a mysterious woman who came to identify a body. A woman who left Imogene and her father when she was a baby, a woman who was always possessed by a powerful loneliness, a woman who many referred to as troubled waters. When Imogene is seventeen, her father, now a famous author of medical mysteries, strikes out in the middle of the night and doesn't come back. Neither Imogene's stepmother nor the police know where he could've gone, but Imogene is convinced he's looking for her mother. She decides to put to use the skills she's gleaned from a lifetime of her father's books to track down a woman she's never known, in order to find him and, perhaps, the answer to the question she's carried with her for her entire life. Rebecca Podos' debut is a powerful, affecting story of the pieces of ourselves that remain mysteries even to us - the desperate search through empty spaces for something to hold on to. Pushing our loved ones away. Running from this or that. Depression doesn't care that you have a family. It doesn't care that you have a job. And some of us come to reason that these things are not okay and seek help. Others wallow in it for years. 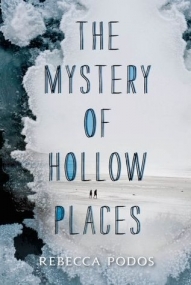 The Mystery of Hollow Places tackles depression in a way that I was not prepared for. It's not the main focus of this book, but it's hard to read it and not feel it there. The writing is beautiful and enthralling and made the book fly by. I never felt bogged down or bored. I was caught up in the mystery of where Imogene's father was and what the deal with her mother was. I was constantly surprised and never really figured things out ahead of time. There was only one problem, and it was the main character. Imogene treats her friend, Jessa, horribly. She's incredibly judgy and somewhat self centered. She's rude to her stepmother who only wants to help her. I don't care if your mother left you when you were young, that does not give you the right to act like you're above everyone else. Like your problems come first. Like you can just give up and tell the world go to hell when things don't work out your way. (and the same goes for Imogene's mother). However entitled she was, I have to give the girl props. She is an excellent detective! I enjoyed the story in The Mystery of Hollow Places just as much as the gorgeous writing.